Cell Transplant. Author manuscript; available in PMC 2014 Jul 7. Cell Transplant. 2014; 23(0): 531–539. Stem cell therapy is an increasingly expanding area of research; in the past few years alone, US National Institutes of Health (NIH) funding for stem cell research has increased over 30% (64). Stem cell therapy has been demonstrated as safe and effective in animal models of stroke. Stem cells display proliferative potential causing them to be impeccably suited for replacing dying cells (72–75,95). The major types of stem cells transplanted in stroke include fetal-derived cells, neuroteratocarcinoma cells (NT2N), xenogenic pig-derived cells, embryonic stem cells (ESCs), perinatal and adult stem cells (bone marrow, human umbilical cord, placenta, amnion fluid, menstrual blood), and induced pluripotent stem cells (iPSCs). Owing to ethical and logistical concerns, and lack of federal funds in the 1990s and for the majority of the first decade of 2000, ESC research has lagged behind adult stem cell research. As a result, current FDA-approved stem cell clinical trials mostly use adult stem cells. Adult stem cells appear to be the preferred treatment for cell therapy in neurological disorders due to their solid safety profile in transplantation therapy (i.e., use of bone marrow and umbilical cord blood in blood-borne diseases). Stem cell transplantation has surfaced as a possible treatment for various brain diseases, such as stroke. Direct transplantation of neural stem cells (NSCs) into the impaired part of the brain showed that NSCs differentiated into neurons, which reestablished the neuronal network and improved spatial recognition in rats (81). Similarly, postmitotic neuron-like cells (NT2N), derived from a male human embryonal carcinoma cell line, traveled long distances after implantation and differentiated into neuron- and oligodendrocyte-like cells (33). After direct transplantation, NT2N cells endorsed functional recovery following focal cerebral ischemia (11,13). NSCs in the brain helped develop morphological and electrophysiological characteristics of neurons (31). Another important method utilizes cells originating from bone marrow. When injected, bone marrow stromal cells (MSCs) migrated and differentiated into astrocytes (48). Results indicated that fresh bone marrow transplanted directly into the boundary of the ischemic area can improve recovery from middle cerebral artery occlusion (24). Likewise, the insertion of MSCs into the striatum of mice after stroke improved functional recovery (52,53). In embryonic rats, MSCs assumed functional neuronal characteristics (63) and differentiated into presumptive neurons in culture (89). Intracerebral grafts of mouse bone marrow assisted in the reestablishment of cerebral blood flow and blood–brain barrier (BBB) after stroke in rats (9). Owing to their logistical advantages (e.g., low risks to baby and mother, ample supply of cells, and very young donor age) and minimal ethical concerns, human umbilical cord blood cells (HUCBCs) seem to be an ideal source for cell therapy (9,65). HUCBCs have demonstrated optimal positive outcome with intravenous (IV) administration (73). In stroke, neuroprotection can be provided by systemic delivery of HUCBCs intravenously (10). This neuroprotection is provided by the neurotrophic factors released by the grafted cells whether by direct effect at the injury site or peripherally (84). HUCBCs do not cross the BBB when delivered peripherally; therefore, common evaluation techniques, such as visualization of the stem cells within the brain, could not be utilized (10). Stem cells also possess therapeutic effects for cerebral palsy (CP) patients. Since neonates have an immature BBB, stem cells are thought to cross the BBB much easier than in the adult brain, causing vast functional improvements. However, systemically administered HUCB grafts have been shown to not efficiently permeate the BBB, necessitating the need to revisit the therapeutic benefits of stem cell therapy in a neonatal hypoxic–ischemic (HI) injury model. The BBB protects the central nervous system (CNS) from entry of immune cells and serum proteins and therefore creates an immune-restricted zone. The BBB helps maintain homeostasis in the cerebral/spinal cord by selectively transporting molecules and cells across the barrier (5,28,36,46,56,58,62,67–69). The unique structure of the microvasculature, which is composed of capillaries formed by endothelial cells that are connected via adherens and tight junctions, makes this control and protection possible (2,45,50). The functional integrity of all BBB components is imperative for the defense of the CNS from harmful blood substances. While the BBB is vital in that it protects the brain from harmful substances entering from the periphery, it also limits the entry of therapeutic biologics such as stem cells and trophic factors. Thus, if we can open the BBB transiently and selectively, allowing in primarily the therapeutic biologics but still excluding the inflammatory cells, then we would be able to aid brain repair mechanisms. Strategies to fragment the BBB have been developed to grant entry of therapeutic agents to the CNS because of the fact that molecules larger than 400 daltons cannot cross the BBB (6,32). Intracerebral delivery of stem cells has been utilized to physically bypass the BBB. Although this method shows great results, surgery is invasive and may pose trauma and surgical complications to the patient, implying that a minimally invasive procedure will be more applicable in the clinic (12). Mannitol is a hyperosmolar, extracellular agent commonly used for the control of raised intracranial pressure (ICP) following brain injury (14). It has been used to decrease cerebral edema for several decades (44,93), remaining the osmotic agent of choice (93). While hypertonic saline has also been used to treat ICP in head injury-afflicted patients (38) with comparable results (16,71), mannitol still remains the standard treatment (16). Mannitol induces osmolarity-driven fluid movement from the cerebral tissue to the intravascular space (87). An increase in intravascular osmolarity causes the net movement of fluid out of the endothelial cells, thus shrinking them (43). This contraction stretches the tight junctions between the endothelial cells along the BBB, consequently increasing its permeability (43). This BBB permeabilization via mannitol is exploited as a drug and therapeutic agent delivery system, for it facilitates entrance of therapeutic biologics into the brain (43). In addition, mannitol can act as a free radical scavenger, providing therapy for biochemical injury (62). Our research group (10,91) found that human umbilical cord blood cells most effectively ameliorated the symptoms of adult stroke and neonatal HI injury when administered in conjunction with mannitol, supporting mannitol's efficacy as a treatment delivery system. The same dose of mannitol (1.1 mol/L mannitol at 4°C) was used for both adult stroke and neonatal HI animal models. In humans, the adult dose is 1.5–2.0 g/kg, while the pediatrics dose is 0.25–1.0 g/kg, both administered intravenously, with an adequate response achieved at a dosage of approximately 100 g in 24 h. In children of all ages for treatment of cerebral edema, a 200 mg/kg dose is recommended (88). Despite the major advances in our scientific knowledge and the clinical entry of stem cell therapy in stroke and CP patients, the use of cell therapy as treatment for human disorders remains an experimental approach (7). Cell therapy has also reached clinical trials to serve as treatment for stroke and CP and several other neurological disorders including Parkinson's disease and Huntington's disease. Altogether, preclinical and clinical studies suggest that transplanted cells tend to solicit one of two mechanisms of action, namely, either replacing damaged host cells or serving as neurotrophic factor-secreting vehicles. Both of these pathways implicate neurorestoration (54), and both require the access of stem cells and/or their secreted growth factors into the injured CNS. As mentioned earlier, traditionally stem cell therapy research uses intracerebral delivery of various stem cell types in order to accurately implant the cells to the site of injury. This invasive procedure has been used to transplant stem cells in various regions of the brain including the ipsilesional subcortex, ventricles (21), and cortex (77). A vis-à-vis study found that a greater number of stem cells survived after intracerebral transplantation than systemic delivery (29). Intracerebral delivery also allows for the targeted placement of transplanted cells, while the peripheral route is less specific. However, inserting instruments into the brain to deliver stem cells causes localized trauma and damages the BBB (26). While many of these studies have yielded positive results, intracerebral delivery is not ideal because of the serious stress the procedure puts on patients. Peripheral routes of transplantation have also been evaluated in stem cell therapy. Numerous studies have revealed that while some peripherally injected stem cells migrate through the BBB, others do not. Human adipose-derived stem cells have been shown to pass through the BBB in mice and ameliorate the detrimental effects of Alzheimer's disease in the brain (47). In addition, clinical evidence reveals that human bone marrow cells can enter the brain and generate neurons (61,86). On the other hand, studies indicate a failure of HUCBCs and hematopoietic bone marrow cells to form new neurons in the brain (19,49,84). Survival of these grafts in the brain directly correlates with amelioration of neurological deficits (12,54); however, if therapeutic factors secreted by stem cell transplants can cross the BBB, the entry of the cells themselves is not necessary for therapeutic benefits (10). Unfortunately, these molecules only have a narrow therapeutic window (10), so this therapy provides limited benefit in chronic disease. In general, noninvasive, systemic, peripheral stem cell transplants are a safer and simpler alternative to the more direct intracerebral route (29). Intracerebral delivery may cause trauma and surgical complications, so IV cell delivery is more practical for the clinic (12). Furthermore, in acute stroke, chemoattractants are upregulated, which may help the movement of intravenously administered stem cells through the BBB. In the chronic stage of disease, once the BBB has reconstituted, stem cells and secreted molecules cannot easily pass into the CNS. Therefore, a minimally invasive procedure delivering stem cells to the brain after reconstitution of the BBB would offer a strategy for advanced CNS therapy. To surmount the hurdle of delivery, we propose that mannitol, used as an adjunctive treatment with stem cell transplantation, will allow for and facilitate delivery of stem cells and their secreted molecules into the CNS, even during the chronic disease stage, due to mannitol's properties as a BBB permeabilizer. In summary, stem cell transplantation as a stand-alone therapy, especially when cell delivery is via the periphery, may not be optimal. 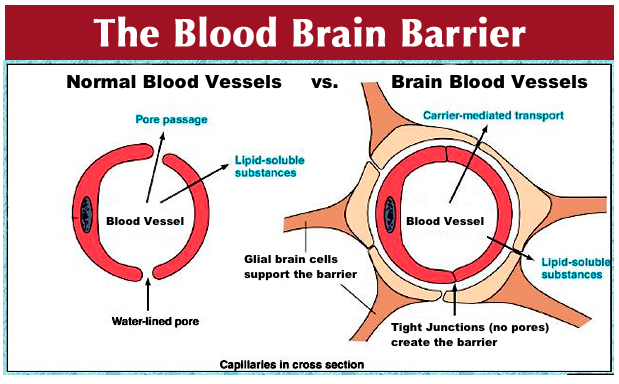 The BBB limits the exchange of soluble factors and cells between brain tissue and blood (59), so it is likely that the BBB hampers the therapeutic benefits of stem cells in the bloodstream. Thus, a therapy that permits the BBB to selectively allow stem cells and neurotrophic factors to enter the brain, while limiting the influx of harmful substances (e.g., inflammatory cells and cytokines), would be ideal (Fig. 1). Neurovascular diseases, including stroke, are ranked third for deaths in the US and first for chronic disability (20,90). In addition, the organs belonging to the nervous system have the most limited ability to regenerate (41). Therefore, therapies for stroke and other neurological diseases are popular topics of medical research. Ischemic stroke is the result of a loss of blood flow to a portion of the brain. This creates an oxygen deficit, which leads to the creation of the infarct core and penumbra areas (34). While the area of dead cells at the core is mostly lost, the penumbra area has the potential to be restored (35). Currently, the only clinically available treatment for stroke is tissue plasminogen activator (tPA), a drug aimed at restoring normal blood flow to the brain (27). However, this treatment is only an option for patients who seek medical attention within a 3-h window of ischemic injury (37). The lack of available treatments has sparked a great deal of ongoing research on stroke therapies, including stem cell treatments. A variety of stem cell types have displayed promising results when tested in various animal models of stroke. The three main categories of tested cells are fetal-derived cells, neuroteratocarcinoma (NT2N) cells (75) and adult stem cells [bone marrow (39), human umbilical cord blood (25), placenta (23), amnion fluid (15), and menstrual blood (1) -derived cells and iPSCs (94)]. Although many studies attest to the efficacy of these stem cells as stroke therapies, it is not fully understood how the transplanted cells provide neuroprotection. However, several hypotheses exist to explain the beneficial effects of stem cell therapy. One such hypothesis suggests that the transplanted cells differentiate into neurons (69). This proposition is supported by the observed correlation between behavioral improvement and the quantity of transplanted cells that display neuron-specific markers (79). However, other research demonstrates that transplanted cells fail to develop normal processes, making it highly unlikely the cells are integrating into the brain's circuitry (96). While stem cells may be differentiating into neurons, it is doubtful that the differentiation is the cause of neuroprotection if the new neurons are not forming synapses with existing neurons. Another possible explanation involving differentiation posits that transplanted cells help by differentiating into neuroectodermal-derived cells. Research has demonstrated the abilities of marrow stromal cells to differentiate into astrocytes (48) and hematopoietic cells into micro- and macroglia (30). There are several ways in which bone marrow-derived stem cells may also promote revascularization following ischemic injury. For example, the integration of cells into damaged tissue by the adhesion of chemokine C-X-C motif receptor 4 (CXCR4)-positive cells and the recruitment of endothelial progenitor cells are assisted by the stromal cell-derived factor-1 (SDF-1)/CXCR4 system (66,91). The role of adult bone marrow-derived cells in the formation of periendothelial vascular cells has also tied bone marrow-derived stem cells to angiogenesis (67). Additionally, the administration of MSCs after stroke promoted angiogenesis around the area of ischemic injury (24). Angiogenesis has been found to protect nerve cells from secondary cell death (36), and therefore all of these findings support the hypothesis that MSCs provide neuroprotection by promoting revascularization. Interestingly, a combined therapy of stem cells with mannitol may prove more effective than stem cells alone. Coupling IV HUCBCs with mannitol afforded more robust neuroprotection than therapy alone (10). Two hundred thousand HUCBCs were injected through the jugular vein of treated rats during the 1-h occlusion of the middle cerebral artery (MCA) over 10 min. Immediately following, 1.1 mol/L of mannitol was administered using the same injection site over 5 min (10). This is probably due to the ability of mannitol to increase BBB permeability, thus making it possible for neurotrophic factors produced by the HUCBCs to cross into brain tissue. The therapy increased the levels of neurotrophic factors in the brain, decreased cerebral infarcts, and decreased behavioral deficits (10). Furthermore, the use of mannitol allows for the early administration of stem cells after stroke, while IV HUCB only displays therapeutic benefits when administered between 24 h and 7 days after injury (10). This proof-of-concept of transplanting HUCB with mannitol shortly after stroke warrants timing optimization studies to determine the therapeutic window of BBB permeabilizer facilitation of peripherally administered stem cells. Although stem cell–mannitol therapy is appealing, the increased permeability of the BBB could exacerbate ischemic injury by increasing inflammation at the injury site (9). In the early stages of stroke, inflammation is a major cause of secondary damage to brain tissue (3). While the mannitol-damaged BBB allows for the movement of stem cells, it may also prompt systemic inflammation by allowing the passage of inflammatory factors (9). A possible solution to the problem posed by the use of mannitol is inhibiting nuclear factor κ-light-chain-enhancer of activated B-cell (NF-κB) activation. It is possible to limit NF-κB expression by using a similar oligonucleotide to compete with and limit the binding of NF-κB and thus prevent additional inflammation (9). The combination of NF-κB with stem cell–mannitol therapy creates a much more regulated passage for stem cells through the BBB, thus preventing harmful inflammation. Nevertheless, despite this possibility of an exacerbated inflammation with prolonged BBB opening, mannitol has a long safety record history in clinical use (e.g., cerebral edema) (88), especially at early stages of stroke. Furthermore, inflammation appears important for migration of stem cells to the site of injury. As noted above, neurorestoration can be achieved without CNS entry of grafted cells but, instead, can be accomplished by stem cell-secreted growth factors crossing the BBB and reaching the injured brain site (10). Neonates are thought to have an immature BBB and lower P-glycoprotein (P-gp) functions than adults (80). Therefore, young brains may allow better entry of stem cells and their neurotrophic factors from periphery to the brain (80). For this reason, neonates may have the potential to respond better from stem cell transplantation and neurotrophic factor treatment. However, that the neonatal BBB may be more conducive to peripheral stem cell therapy has largely remained underexplored. Accordingly, we sought to demonstrate the facilitative effects of mannitol in neonates (10). Mannitol increases the behavioral recovery of neonatal HI injury animals by permeating the BBB (10). HUCB transplantation combined with the previous treatment can further increase the CNS levels of at least three neurotrophic factors. This cocktail of trophic factors elevated in the HI brain generates a robust functional improvement (10). Additionally, the improved passage of neuroprotective molecules into the CNS also indicated an overall improvement. Since HI brain injuries are considered acute ischemic insults (82), they involve a specific cell therapy, which is delivered through IV injection (18). The HUCB cell transplantation occurred 24–72 h postinjury. The dose of 200,000 cells was administered to the neonatal rats and resulted in significant behavioral improvements in a HI animal (92). The HI-damaged animals completed a series of motor exams 7 days posttransplantation and 14 days posttransplantation (92). Relative to the control group, the IV HUCB grafts alone, vehicle alone, and mannitol alone revealed no detectable elevations in growth factors in rats (10). This conclusion supports the notion that combined treatment of HUCB and mannitol led to the recovery of HI-injured animals by elevating the trophic factors in the brain, rather than in the peripheral blood circulation. In addition, results suggest that mannitol combined with HUCB leads to a stronger recovery of neurologically injured animals (92). A neurodevelopmental condition that manifests in early youth (70), CP is similar to HI in that it affects the same region of the brain. The majority of children are diagnosed between the ages of 3–5, with prevalence decreasing with increasing gestational age (42). The majority of CP cases are a result of genetic syndrome (27,51), in addition to brain infections (40), head injuries (4), vehicular accidents (55), or child abuse (78). Physical therapy, in addition to daily medications, can drastically improve a child's daily routines (17,57,83); however, there is no remedy for CP. Owing to the fact that CP affects the hippocampal area, damages in a rat neonatal HI model reproduce the same injury as many CP patients (10). Therefore, this opens the door into research for cell therapy for CP patients (10). Since CP and HI are so closely related, the dosage of mannitol and HUCB remains constant. An infant is not diagnosed with CP until weeks after birth; thus, the timing of cell transplantation and mannitol was adjusted accordingly. The results indicated that mannitol still has the ability to intensify therapeutic effects of HUCB with a 1-week delay. This suggests that the combination of HUCB and mannitol is essential for optimizing the outcome of the cell therapy (10). This minimally invasive procedure allows for a less traumatic approach while still having a robust behavioral recovery. As mentioned above, mannitol has a solid safety profile in the clinic for cerebral edema, including its use in neonates (88). Of note, clinical trials of transplanting autologous HUCB in neonates with HI and in children with CP are progressing at Duke University and Medical College of Georgia (85). A combination of HUCB and mannitol may improve therapeutic outcome in HI and CP. In both case studies involving stroke and CP, cells were delivered acutely after the injury occurred. Future studies involving the chronic delivery of cells with mannitol will open various new avenues of research and eventually lead to clinical application. These methods could greatly benefit patients who suffer from acute brain diseases but also chronic neurodegenerative disorders such as Parkinson's disease, Alzheimer's disease, etc. Along this line of investigation, the BBB permeabilizing effects of mannitol in facilitating stem cell therapy have been examined in other neurological diseases. Intravascular injection of human bone marrow stromal cells (MSCs) significantly improved neurological functional recovery in a rat model of intra-cerebral hemorrhage (22). Additionally, MSC transplantation combined with mannitol in traumatically injured rats resulted in increased MSCs in the injured brain tissue of rats that were treated with mannitol (76). Behaviorally, rats treated with MSCs and mannitol showed improved recovery of neurological and motor functions (76). These results indicate that systemic stem cell delivery has broad therapeutic potential and should entice the scientific community to further study the therapy chronically, with the caveat that manipulating the BBB via permeabilizing agents such as mannitol is critical in these applications. Although the strategy of BBB transient permeation has primarily targeted facilitation of transplanted cells to migrate into the injured brain, this momentary BBB opening may also mobilize endogenous stem cells from the bone marrow to hone into the brain as well. Consequently, trophic factors from both the transplanted and endogenous cells will benefit from such BBB alteration. However, permeating the BBB may allow harmful chemokines or cytokines such as inflammatory cells to similarly breach the barrier and exacerbate the area disease pathology. Therefore, the timing of permeation and the leakage size should be critically assessed and regulated in order to selectively allow therapeutic cells and growth factors to cross the BBB. The development of a next generation of high-breed BBB permeabilizers will be important to achieve this selective BBB permeation for improving the outcomes of stem cell therapy. One such example is Cereport, which is a bradykinin receptor agonist that transiently increases BBB permeability (8). Compounds such as Cereport can highly regulate the timing and size of BBB permeation, thereby selectively allowing stem cells and their trophic factors to penetrate the brain, while limiting the entry of potentially deleterious inflammatory cells and cytokines. Importantly, however, we currently have a worldwide available drug, mannitol, with a solid safety profile history for clinical use. As such, mannitol should expedite the translation of a combined BBB permeabilizer and cell therapy for stroke, HI, and CP, as well as other neurological disorders.